It's strawberry season here in northern Vermont. 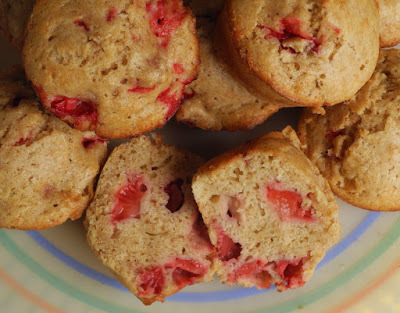 Along with strawberry shortcake, a recipe I love is this one for strawberry muffins, which came from a container of Stonyfield Farm yogurt. Using yogurt instead of milk adds extra flavor to the muffins. I usually freeze some chopped strawberries so I can make these during the winter. The same recipe works well for blueberries or raspberries (I'd much rather have a raspberry muffin than a blueberry one). Mix flours, sugar, and baking soda in a bowl. In another bowl, beat eggs, then mix them with the yogurt, melted butter, and vanilla. Toss the strawberries in the flour mixture, then pour liquid ingredients into the flour and blend. Spoon batter into greased muffin tins: 12 for smaller muffins, 10 for larger (I prefer fewer larger muffins). Bake for 20-25 minutes, until top is golden and batter is cooked through. I love your blog. I have been in Northern Vermont all June and it has been blissful and inspiring. Thanks for sharing your recipe...maybe I can take Vermont with me through the kitchen as well as the studio. Thanks so much, Tilly; I'm happy you enjoy the blog. There are lots more recipes; just click on "recipes" at the bottom of the post.